Monticello, located near Charlottesville, Virginia, was the estate of Thomas Jefferson, the principal author of the Declaration of Independence, third president of the United States, and founder of the University of Virginia. The house is of Jefferson's own design and is situated on the summit of an 850-foot-high peak in the Southwest Mountains south of the Rivanna Gap. Monticello, in Italian, means "little mountain." An image of the west front of Monticello was featured on the reverse of the five-cent coin (the “nickel”) of the United States coined from 1938 to 2003 (the image returned to the reverse on the 2006 coin design) and on the reverse of the United States of America two dollar bill that was printed from 1928 to 1966. Monticello was designated a World Heritage Site in 1987, an honor it shares with the nearby University of Virginia. Work began on Monticello in 1768, and Jefferson moved into the South Pavilion (an outbuilding) in 1770. The original design was based on the classical style of Palladian architecture. When Jefferson left Monticello in 1784 for extended travels in Europe, the original design of the house was largely completed except for porticos and decorative interior woodwork. Upon his return, Jefferson expanded his vision for Monticello to incorporate features of Palladian buildings and ruins he admired overseas. Further work to the new design began in 1796. Construction of Monticello was substantially completed in 1809 with the erection of its distinctive dome. Jefferson died on July 4, 1826, and Monticello was inherited by his eldest daughter Martha Jefferson Randolph. Financial difficulties led to her selling the estate to James T. Barclay, a local apothecary, in 1831. Barclay sold it in 1834 to Uriah P. Levy, the first Jewish-American to serve an entire career as a commissioned officer in the United States Navy. 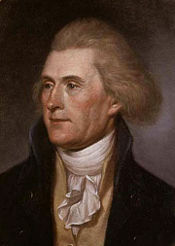 Levy greatly admired Jefferson. During the Civil War, the house was seized by the Confederate government and sold. 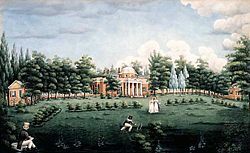 Levy's estate was able to recover Monticello after the war. Lawsuits filed by his heirs were settled in 1879, when his nephew, Jefferson Monroe Levy, a prominent New York lawyer, real estate speculator, and member of Congress, bought out the other heirs and took control of the property. Jefferson Levy, like his uncle, repaired, restored, and preserved Monticello, which was deteriorating seriously while the lawsuits wended their way through the courts in New York and Virginia. A private, nonprofit organization—the Thomas Jefferson Foundation—purchased the house from Jefferson Levy in 1923. 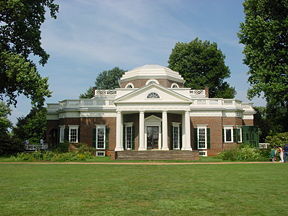 Monticello is now operated as a museum and educational institution. Visitors can view rooms in the cellar and ground floor, but the second and third floors are not open to the general public. Monticello is the only home in the United States of America that has been designated a World Heritage Site. From 1989 to 1992, a team of architects from the Historic American Buildings Survey (HABS) painstakingly created a collection of measured drawings of Monticello. These drawings are now kept at the Library of Congress. The World Heritage Site designation also includes the original grounds of Jefferson's University of Virginia. Among Jefferson's other designs are his other home near Lynchburg, Virginia called Poplar Forest and the Virginia State Capitol in Richmond. Jefferson was an accomplished architect who was extremely influential in bringing the Neo-Palladian style—popular among the Whig aristocracy of Britain—to the United States. The style was associated with Enlightenment ideas of republican civic virtue and political liberty. In Monticello, Jefferson included automatic doors, the first swivel chair, and other convenient devices he invented. Nearby is the only university ever to have been founded by a president, the University of Virginia, of which the original curriculum and architecture were designed by Jefferson. Jefferson is also credited with the architectural design of the Virginia State Capitol building, which was modeled after the Maison Carrée at Nîmes in southern France, an ancient Roman temple. Jefferson's work on Monticello helped initiate the ensuing American fashion for Federal-style architecture. Located at the center of the hilltop on an estate of one thousand acres, Monticello's land is owned and administered by the Thomas Jefferson Memorial Foundation, which includes a total of 1,900 acres, all of which is part of the original tract of land owned by Jefferson. The house was the center of a plantation of five thousand acres, tended to by some 150 slaves. Constructed of red brick and white wood trim, the house at Monticello measures 110 feet, two inches in length from north to south, and 87 feet, nine inches in width from east to west. Its height is 44 feet, seven inches. The main entrance portico is in the east facade, and is marked by a triangular pediment supported by four Doric columns finished in sand paint running across the front. The dome-crowned, west facade is the house's most photographed view. The dome, above a projecting portico, is composed of four Doric columns that run across the front and two columns at the sides. The slightly oblong dome, measuring 31 feet on the east-west line and 28 feet on the north-south line, rises 18 feet, nine inches from the base to the oculus. The dome is covered with sheet metal as is the roof of the house. Two central rooms occupy the first floor, with four major spaces on each side. Entering the large entrance hall, one is led into the parlor through a glass double door, both of which open when one door is moved, an innovation created by Jefferson. North of this axis are the dining room, the tea room, and two small bedrooms, while to the south are Jefferson's bedroom, sitting room, library, and study. A piazza leads from the sides of the house to the north and south terraces above the support wings. To the credit of Jefferson the inventor, the first floor is replete with decorative and mechanical features as well as furnishings which make the house unique among neoclassical villas. Jefferson selected designs associated with the fertility of the earth and religious symbols from classical Roman buildings for cornices and friezes for major rooms. Jefferson wisely placed his bed in the alcove between his bedroom and library so that he could have the choice of entering either room after waking. To facilitate the transport of wine from the wine cellar to the dining room, Jefferson had mechanical dumb waiters built into either side of the mantel. To reach the upper floors, one must climb two small stairways, each 24 inches wide. On the second floor are five bedrooms, which are connected by a mezzanine that can be seen from the first floor entrance hall. The third floor has three additional bedrooms and a large dome room. West of the house is an irregular oval inner roundabout walk, bordered with flowers. Between the inner roundabout and the outer roundabout are groves of trees. Demonstrating Jefferson's fondness for horticulture are vegetable gardens, vineyards, and orchards extending to the south on a slope. Much of Monticello's interior decoration reflects the ideas and ideals of Jefferson himself. The original main entrance is through the portico on the east front. The ceiling of this portico incorporates a dial connected to a weather vane, showing the direction of the wind. A large clock face on the external, east-facing wall has only an hour hand since Jefferson thought this was accurate enough for outdoor laborers. The clock reflects the time shown on the "Great Clock" (designed by Jefferson) in the entrance hall. The entrance hall contains articles collected by Lewis and Clark on their famous expedition. The floorcloth here is painted grass green, since Jefferson wanted it to feel as if he were still outdoors when he walked in the door. The south wing includes Jefferson's private suite of rooms. The library holds many books in Jefferson's third library collection. His first library was burned in a plantation fire, and he donated his second library to Congress to replace the books burned by the British. This second library formed the nucleus of the Library of Congress. As famous and "larger than life" as Monticello seems, the house itself is actually no larger than a typical large home. Jefferson considered much furniture to be a waste of space, so the dining room table was erected only at mealtimes, and beds were built into alcoves cut into thick walls that contain storage space. Jefferson's bed opens to two sides: to his cabinet (study) and to his bedroom (dressing room). The west front (illustration) gives the impression of a villa of very modest proportions, with a lower floor disguised in the hillside. The north wing includes the dining room—which has a dumbwaiter incorporated into the fireplace as well as dumbwaiters (shelved tables on casters) and a pivoting serving door with shelves—and two guest bedrooms. The main house was augmented by small outlying pavilions to the north and south. A row of functional buildings (dairy, wash houses, store houses, a small nail factory, a joinery, etc. ), and slave dwellings known as Mulberry Row lay nearby to the south. A stone weaver's cottage survives, as does the tall chimney of the joinery, and the foundations of other buildings. A cabin on Mulberry Row was, for a time, the home of Sally Hemings, Jefferson's slave and probably lover who is thought to have been the mother of several children fathered by him. She later moved into a room in the "south dependency" below the main house. On the slope below Mulberry Row Jefferson maintained an extensive vegetable garden. In 2004, the trustees acquired the only property that overlooks Monticello, the tall mountain that Jefferson called Montalto, but known to Charlottesville residents as Mountaintop Farm. Rushing to stave off development of so-called "McMansions," the trustees spent $15 million to purchase the property, which Jefferson had owned and which had served as a twentieth-century residence as farm houses divided into apartments, to many University of Virginia students including former Virginia Governor George Allen. The officials at Monticello had long viewed the property located on the mountain as an eyesore, and were very interested in purchasing the property when it became available. Jefferson died on the Fourth of July, 1826, the fiftieth anniversary of the adoption of the Declaration of Independence, the same day but later in the day, as John Adams' death. 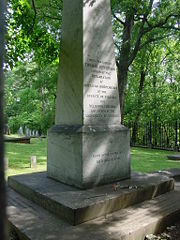 Jefferson is buried on the Monticello estate. Following his death, a family member found a drawing indicating what he wanted written on his tombstone, which was in the shape of an obelisk. Below his name, Jefferson listed what he considered to be his three major accomplishments. Of conspicuous absence were his well-known, political offices: governor of Virginia, secretary of state, vice president, and, obviously, president. ↑ National Register Information System, National Park Service. Retrieved July 11, 2007. This page was last modified on 19 October 2018, at 16:00.